I’ve been trying to make simple recipes really well lately and was trying for the perfect, inexpensive and simple pasta dish last night. I’m getting closer but don’t think I’ve nailed it yet. I took fresh tomatoes and blanched them, then peeled them and put them, with salt and pepper, in a covered pot on medium-low heat for an hour or so. Then took a potato masher and mashed them. In another pot I took some olive oil, garlic, basil and crushed red pepper and let that simmer at low heat for 20 minutes or so. After I mashed the tomatoes and took out the basil leaves and then added the rest of the olive oil to the tomatoes and stirred, recovered and let it simmer at low heat for 10 minutes or so. Then, boiled the pasta. In a saucepan I added butter, some of the pasta water, the pasta and the tomato sauce and sautéed for a minute. Then plated it all with some sliced basil and some more crushed red pepper. 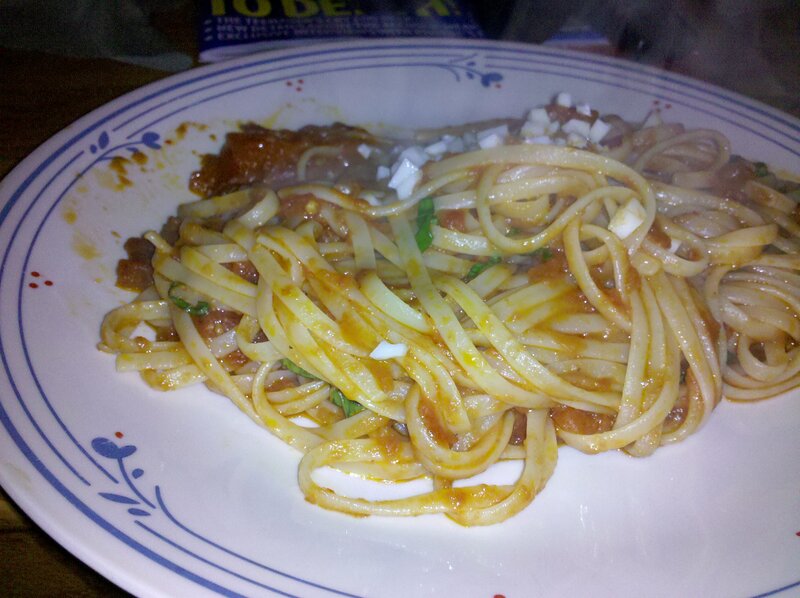 I used too much olive oil and canned tomatoes (already peeled, I figured why not) so I don’t think looked right. It tasted good, but it can be perfected still. This entry was posted on 28 April, 2010 at 10:16 am and is filed under Uncategorized. You can follow any responses to this entry through the RSS 2.0 feed. You can leave a response, or trackback from your own site.